Every good detailer knows that color-coding or labeling tools will prevent cross-contamination. This practice keeps you from using a polish applicator on the windows or a buffing towel on the wheels. The same principle applies to the wash and rinse buckets. By identifying the buckets, you'll be able to keep the wash water cleaner and therefore you'll transfer less dirt back to your vehicle while you're washing. If you're wondering why you even need two buckets, let me introduce you to the two bucket wash method. One bucket is filled with soapy water. The other is filled with clean water. Each time you need to reload your wash mitt with suds, first rinse it in the rinse bucket. Then reload the mitt with soap and continue washing. You'll notice that a lot of dirt accumulates in your rinse bucket. That's dirt that ISN'T being deposited back onto the vehicle. The Wash and Rinse stickers designate the purpose of each bucket to prevent cross-contamination. 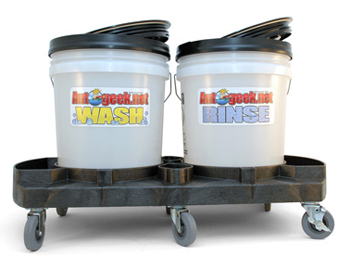 You can designate your buckets strictly for detailing with these Wash and Rinse labels. It's just a simple thing you can do to help prevent swirls. Buy each label or both. I just purchased the two bucket combo kit and was hoping to be able to order two different color buckets to readily identify wash from rinse but was not allowed. In lieu of that these stickers will be helpful.